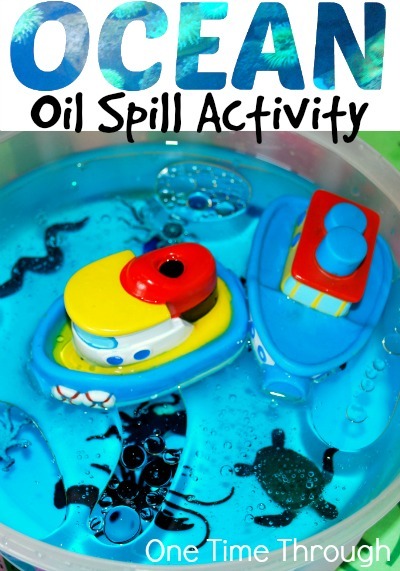 This protect our oceans oil spill activity is a really fun, hands-on activity that teaches kids about how oil spills happen, their effects on ocean habitats, and how difficult they are to clean up. It is deceptively simple, but the experience packs a big learning punch and had a large emotional impact on my son (who I refer to as Onetime). I also have a roundup of 10+ ocean learning activities for kids that will inspire kids to appreciate our oceans and naturally help them to want to protect them as well! Today’s post includes Amazon Affiliate links. Read our Disclosure for more details. What Got Us Studying Oceans? On a recent holiday to Hilton Head Island, South Carolina, my family enjoyed a week of beach combing, sandcastle building, and dipping our toes in the salty Atlantic. Although we didn’t actually swim (way too cold still! ), we did spend nearly every day by the seaside. Onetime had lots of questions about the ocean, what lives in it, and how the tides work and why. One morning, we were walking along the beach and Onetime noticed some whitish-red foam washing up on the seashore. “What is that Mommy?” he asked, and we began to discuss water pollution. Back at home, we came across a blurb in a water pollution book about oil spills, and I realized that Onetime needed a hands-on way to understand the effect of this kind of problem and so my brain conjured up this fun (and truly powerful) activity. While learning about the ocean along with my son, we learned a few important facts that you may want to share with your kids too. 1. Oceans cover 71% of our Earth. 2. Phytoplankton that live in the ocean create 50 to 85% of the oxygen we breathe. 3. Our oceans are becoming increasingly polluted and damaged by garbage, chemical waste, overfishing, and oil spills. See our Polluted Ocean Sensory Bin and learn about the Great Pacific Garbage Patch. 4. There are dead zones in the oceans where no fish can survive because the water is so polluted. 5. These dead zones are growing in size every year – mostly because of things humans are doing to the ocean. 6. Even if we don’t live close to the ocean, we can do things in our everyday lives that damage our oceans, or help protect them. Before we do hands-on learning activities at my house, I like to read my son related books if possible. Prior to this activity, we read one awesome book that I highly recommend! This fantastic mix of fiction and non-fiction gives kids a detailed idea of what kinds of plants and animals live below the waves – with a humorous plot line and fantastic illustrations! We also read the first part of this next book – to introduce the idea of oil spills and the harm they can do to the ocean. Then, pausing in the book before it starts to discuss how oil spills are cleaned up, I asked Onetime if he wanted to try to clean up an oil spill himself? He was very excited to try! I took him to the kitchen where I had set up a miniature ocean in a large plastic tub container. I filled the bowl with water with blue food colouring, some plastic boats and sea creatures. 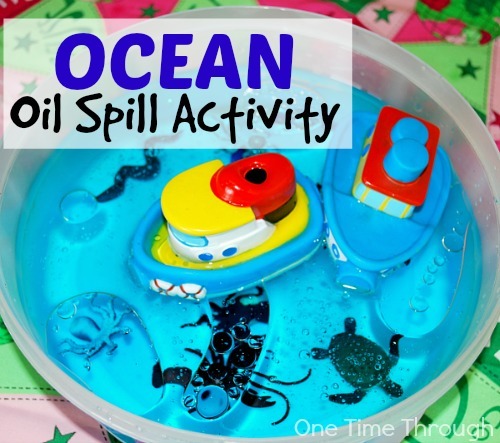 I let Onetime play with the ocean for a bit and then we decided to make our oil spill. Onetime crashed the boats together and I squirted in some olive oil! Then – I asked Onetime to try and figure out how we were going to clean up the ocean. His first idea was to “Scoop it out Mommy!” – so I got him a large soup ladle and he began trying to remove the oil in earnest. When that didn’t work, I suggested he try a paper towel to soak it up. We even tried a cloth diaper too – which of course didn’t work. Finally, Onetime suggested we try soap. So we squirted some dish detergent into the water and observed how the oil split up into smaller blobs, but didn’t go away. Lastly, Onetime wanted to try a sponge – to no avail. We then had a really deep discussion about how difficult it is to clean up oil spills. I then asked my son how he thought our ocean animals were doing. When he picked them up, he could feel them covered with oil and made a really sad face. I then gave him a feather and told him to dip it into the water. We talked about how water birds also get covered with oil when there is a spill and he got even quieter (look at the face below!). We dipped another few feathers in the oil, and took them to the sink and washed them out with soap and even gave them a blow-dry! 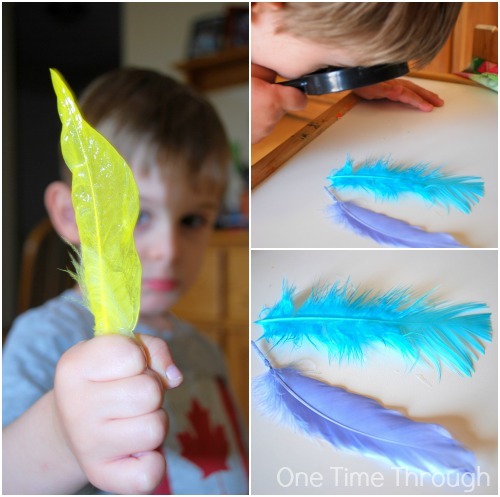 Using a magnifying glass, I asked Onetime to compare the feathers that had been cleaned to ones that hadn’t been covered in oil. It was clear that we couldn’t get the feathers back the way they had been. We talked about how many sea birds get hurt by oil spills and how there’s not always someone there to clean them, and how they cannot fly after they’ve been coated in oil. Again – sad face. Although that was the end of our activity – we didn’t leave things on a depressing note. We revisited our Oil Spill book and learned more about how spills are cleaned up, as well as about things we could do to help prevent oil spills from happening in the first place. It was a powerfully educational activity that had a big impact on my son and I hope you give it a try! Follow One Time Through’s board To the Beach on Pinterest. Hope you enjoy trying some of these hands-on ocean activities and that your kids learn – as much as they have fun! 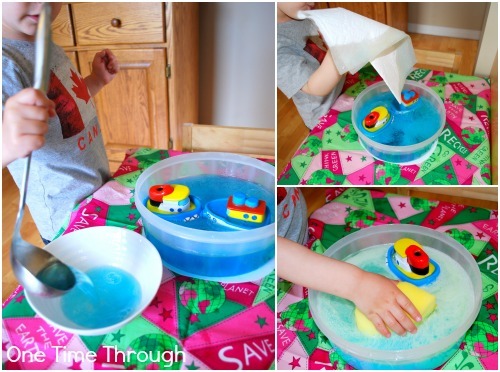 Thank you for including the Ocean Sensory Bin and the Alphabet Shells Sensory Bin from Pre-K Pages!